Earth's Moon is an unusual object in our solar system, and now there's a new theory to explain how it got where it is, which puts some twists on the current "giant impact" theory. The work is published Oct. 31 in the journal Nature. The Moon is relatively big compared to the planet it orbits, and it's made of almost the same stuff, minus some more volatile compounds that evaporated long ago. That makes it distinct from every other major object in the Solar System, said Sarah Stewart, professor of earth and planetary sciences at the University of California, Davis and senior author on the paper. "Every other body in the solar system has different chemistry," she said. The textbook theory of lunar formation goes like this. Late in the formation of the solar system came the "giant impact" phase, when hot planet-size objects collided with each other. A Mars-sized object grazed what would become Earth, throwing off a mass of material from which the Moon condensed. This impact set the angular momentum for the Earth-Moon system, and gave the early Earth a five-hour day. 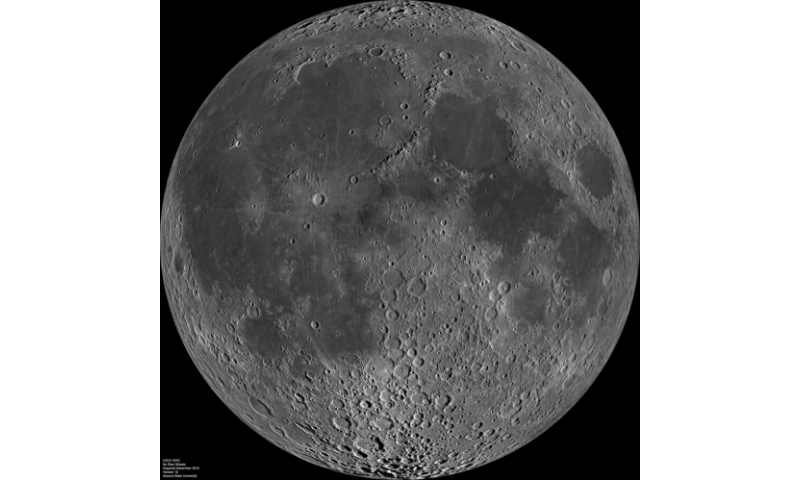 Over millennia, the Moon has receded from the Earth and the rotation has slowed to our current 24-hour day. 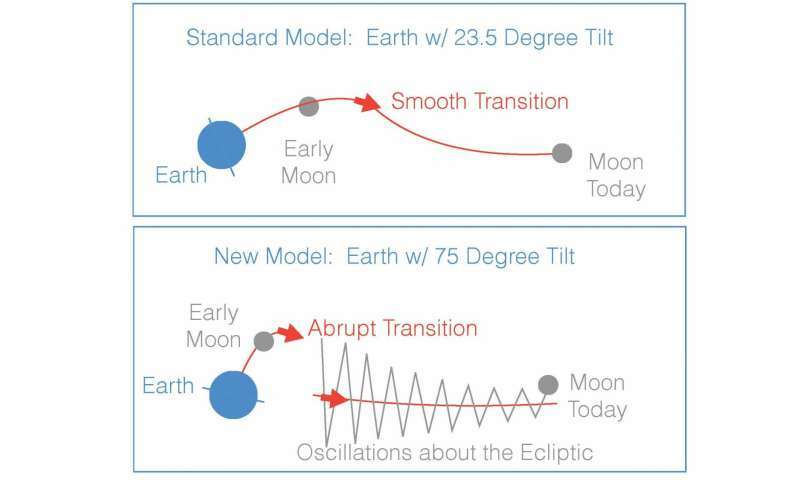 Scientists have figured this out by looking at the Moon's current orbit, working out how rapidly angular momentum of the Earth-Moon system has been transferred by the tidal forces between the two bodies, and working backwards. But there are a couple of problems with the textbook theory. One is the Moon's surprisingly Earth-like composition. Another is that if the Moon condensed from a disk of material rotating around Earth's equator, it should be in orbit over the equator. But the Moon's current orbit is tilted off the equator, meaning some more energy must have been put in to move it. Stewart, her former postdoctoral fellow Matija Ćuk (now a scientist at the SETI Institute in Mountain View, Calif.), with Douglas Hamilton at the University of Maryland and Simon Lock, Harvard University, have come up with an alternative model. In 2012, Ćuk and Stewart proposed that some of the angular momentum of the Earth-Moon system could have been transferred to the Earth-Sun system. That allows for a more energetic collision at the beginning of the process. In the new model, a high energy collision left a mass of vaporized and molten material from which the Earth and Moon formed. The Earth was set spinning with a two-hour day, its axis pointing towards the Sun. As angular momentum was dissipated through tidal forces, the Moon receded from the Earth until it reached a point called the "LaPlace plane transition," where the forces from the Earth on the Moon became less important than gravitational forces from the Sun. This caused some of the angular momentum of the Earth-Moon system to transfer to the Earth-Sun system. This made no major difference to the Earth's orbit around the Sun, but it did flip Earth upright. At this point, the models built by the team show the Moon orbiting Earth at a high angle, or inclination, to the equator. Over a few tens of million years, the Moon continued to slowly move away from Earth until it reached a second transition point, the Cassini transition, at which point the inclination of the Moon—the angle between the Moon's orbit and the Earth's orbit about the sun—dropped to about five degrees, putting the Moon more or less in its current orbit. The new theory elegantly explains the Moon's orbit and composition based on a single, giant impact at the beginning, Stewart said. No extra intervening steps are required to nudge things along. "One giant impact sets off the sequence of events," she said. There are violent forces at play. The forces of the Sun, Moon and Earth dance together giving us seasons, tides etc. The Sun recently has been stepping on toes as it glides through this dance sending our north magnetic pole whizzing away a thousand miles to wards Russia then coming home to dance around an 85km oval every 24hr. The big kahuna Earths NUCLEUS is not PHASED by this UNTIL! Our NINTH Planet third or fourth from the sun comes bar-ling around the Sun appearing to be heading right for us. I Bruce Voigt claim that the recently discovered Asteroid 2002 AA 29 is really a Moon of (and yes I have named this Planet) OLD BRUCE. OLD BRUCE orbits the Sun in close proximity to Earths orbit every 365 point something day's and the Earth is slowly catching up or visa versa. In approximately sixty five million years from now OLD BRUCE will be close enough to change (like a magnet) Earths Nucleus direction. At that very moment instant freezing takes place and because of no gravity any thing not attached drifts out into Earth orbit to be collected by the Moon. (Good real estate investment for an optimist). So after all that you now know what really happened to DINO and what causes Venus to constantly change rotation. If the Theia impactor formed at an L4/L5 point in Earth's orbit, its elements would have the same isotopic ratio as Earth and one of the two "problems" in the Giant Impact theory doesn't exist. bobbysius, that hypothesis does seem to try up some loose ends. I would be more comfortable with the conclusions here if they at least considered the possibility. In the new model, a high energy collision left a mass of vaporized and molten material from which the Earth and Moon formed. The temperature of the interior of the earth after 4.5 billion years would seem more likely if the earth and the impactor were both vaporized by the collision. If the result stands up the high velocity collision mixing scenario is even more robust. There are some results that doesn't agree, sych as a recent minute difference in isotope ratios but that can be method error, and some finds of heterogeneous mantle material implying incomplete mixing between proto-planet Tellus and impactor Theia but that can perhaps be incomplete understanding of mantle processes. @dogbert: The initial core heat (i,e, without later radioactive heating) is a sum of many impacts as a planet accrete, and large planets like Earth and Venus were likely molten throughout anyway. But sure, this result makes it pretty much certain if it is correct. Optical, somebody needs to be interested in more than just the latest media obsession and actually care about how the Earth and Moon formed. Even if the majority perceive this as being a "useless" problem, we know from past experience that sometimes obscure facts can be used to achieve practical results. Don't forget that terraforming looks to be in our future, so the more we know about planetary formation, the better. bschott, it is my sincere hope the struggle to terraform Mars will help us to better appreciate Earth. One might analogize the human race to a child that doesn't really appreciate something until he/she earns it on their own. Maybe we too will grow up a little bit and gain a more adult perspective on these issues. I like it and the math works. No moon creation theory will ever be confirmed. The many, many factors that go into its creation cannot be accounted for. How many other planets/orbital bodies were around at that time? What influence would they have on the creation? What other factors, now extinct, were in play? No way to tell or even approximate. So any "new" theory that claims to be more "correct" than any previous theory is preposterous. The unknowns far, far outweigh the knowns, and as such most of these theories will remain ripe for discussion, but not for confirmation. The moon was created from material ejected from an impact. Almost certainly. But if it was a direct impact, a glancing impact, multiple simultaneous impacts, etc, is, and always will be conjecture. "The NEW THEORY elegantly explains the Moon's orbit and composition based on a single, giant impact at the beginning, Stewart said. No extra intervening steps are required to nudge things along." In what way is this a "theory"? Is this a theory in the scientific sense of the word? Or in the normal use of the word? Basically a new hypothesis? If a new theory, how can there have been so many "theories" about the formation of the moon in the past and have them all be wrong? I think they are playing fast and footloose here with the word "theory" here. They always condescendingly correct people who say "It's only a theory. ", but then they turn around and misuse the word themselves. They know better so that makes it purposeful "mistake" rather than an ignorant mistake. By the way, in what way is this an "elegant" theory or explanation? What standards are used to determine if it is elegant or not? Opinion is fine, but even if it sounds elegant, that doesn't mean it true. "Moon origin theories are concocted in computers, not by watching them happen. By adjusting the angle of impact, she and her team got the moon material to wobble around the ecliptic until it settled down over "a few tens of millions of years." She thinks this explains all the observations in one blow." "Consider all the assumptions here. You have to have the right-size impactor. It has to come at the right speed. It has to impact at the right angle. It has to mix the materials just right. It has to wobble for just the right amount of time. Pile on assumption after assumption, then twiddle the knobs in the model just so, and presto! A beautiful moon, perfect for life."